Retrieving and processing a PDF in Decisions can be done using several different steps. 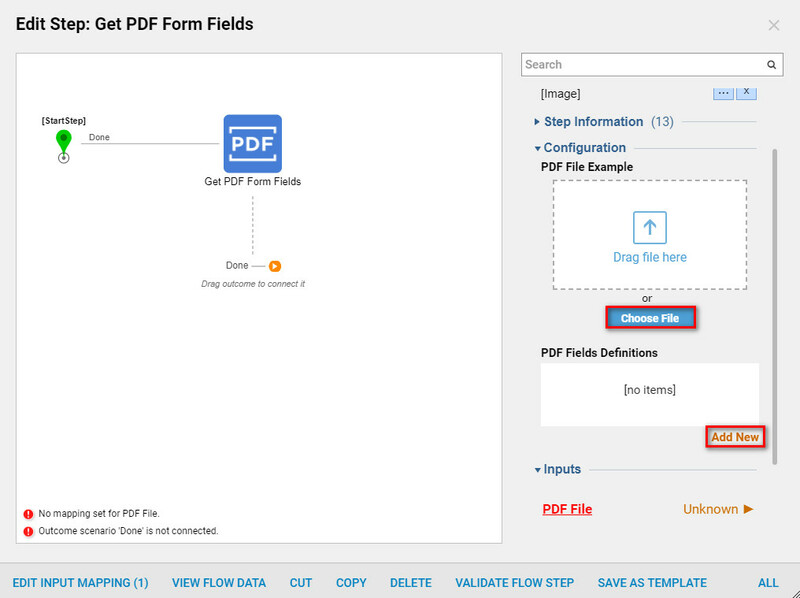 The PDF Form Field	values can be extracted and used as a variable in a flow using the Get PDF Form Fields Step. This step is found in the Steps Tab under the Data> PDF>	category. When using the Get PDF Form Field Step	the PDF should be uploaded twice. In the step properties edit the step by adding the PDF file. The first, PDF Form Field	is called the Example PDF	and this file will auto-populate the PDF Feild definitions. Next, in the step properties, the PDF should be uploaded again as the Inputs to the PDF file. 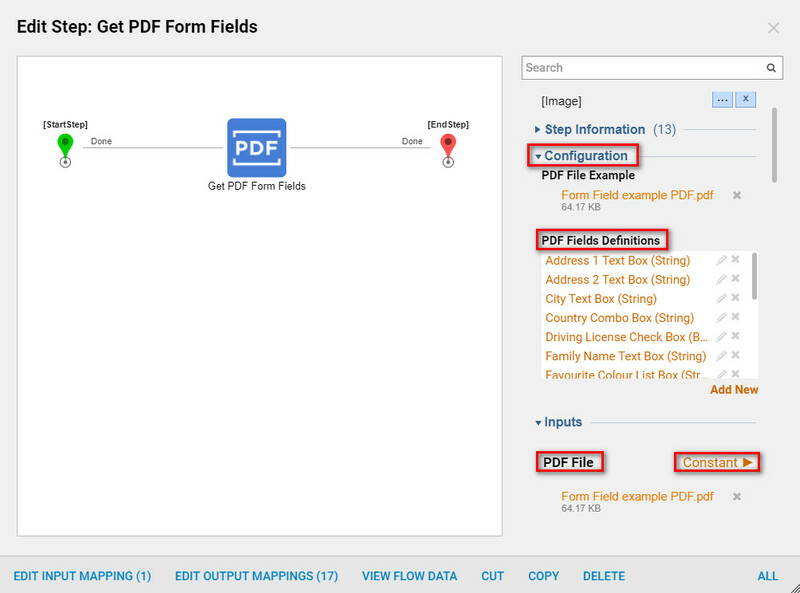 After both PDF's are uploaded the designer can then map the form fields to be used downstream. In the Flow designer, navigate to theSteps Tab	and locateData> PDF> Get PDF Form Fields. In the PDF	category, different PDF Steps are available for different PDF transactions that can be used in the Flow. 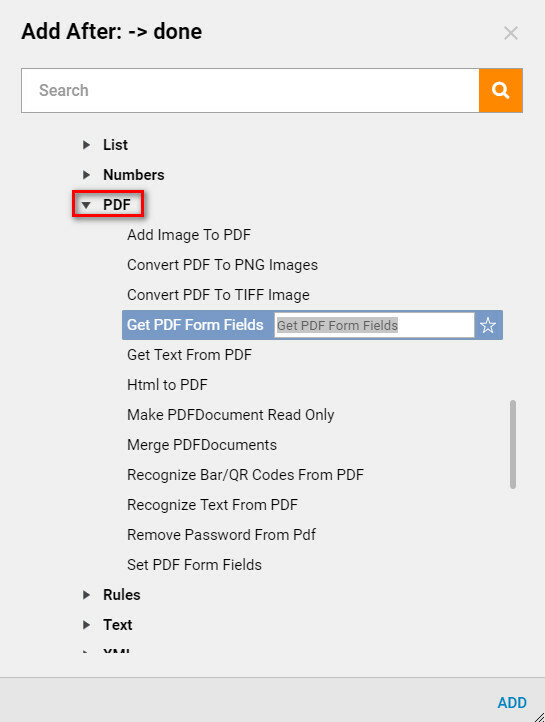 On theGet PDF step	in the configuration category under PDF File	example choose File	or Drag	the PDF file	into the text box to upload a PDF. Under PDF Fields Definitions select Add New to add field definitions. After thePDF Example File	is uploaded, Decisions will auto-populate the PDF Field Definitions	and they will appear in the text box under PDF Field Definitions.